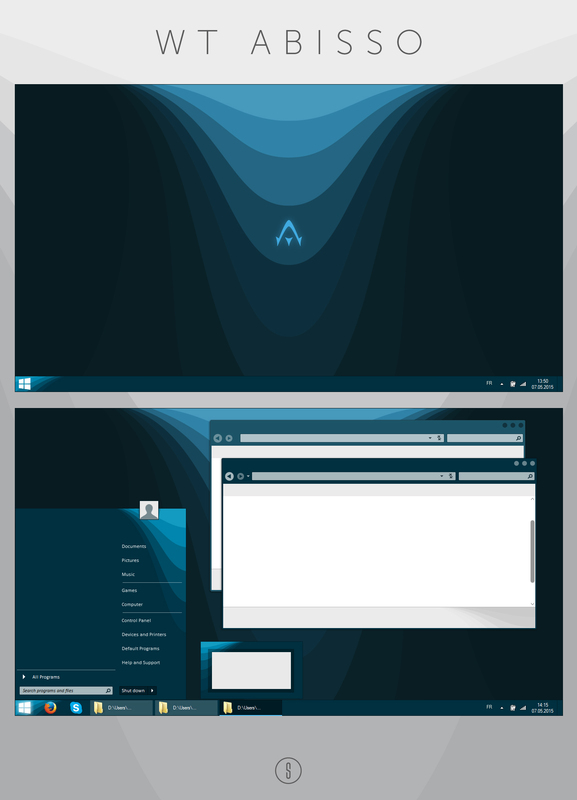 "WT ABISSO" is a minimalist WindowBlinds skin which I created to give Windows 7 a simpler, flatter and more elegant look. In its default state, the skin is opaque, but you can (independently) apply transparency and blur to different part of the UI simply by playing with the WindowBlinds settings. "WT ABISSO" also features a substyle which can replace the big "start button" by a smaller one so it could look nicer (not cut off) for those who like to set the taskbar icons size to "small". The skin package also contains the wallpaper you can see on the screenshot and in three different resolutions. Hope you'll enjoy using it. P.S. For those who like to use Firefox (version 29 and above), I suggest them to enable the "title bar" option in the Firefox customization panel so it could avoid issues with the way the title bar displays while using WindowBlinds skins. 30/05/2015: Modified the start menu panel left side background color. Replaced the former wallpaper by a new one with the "Abisso" symbol. Replaced the former explorer address field "refresh" icon. It colored very nicely and I like really these buttons. Great job. Thanks. Thanks Ace, Pete and Adni for your feedbacks about this new skin. I am glad that you appreciate it! This skin is excellent for my collection. I love the colors and design, especially when I turn it to green. It is also compatible for my Windows 8/8.1 laptop.